Bombardier took over management of Willesden depot from London Overground in mid-November 2016. With the changed arrangements it became clear that the continued daily stabling of 86259 at Willesden would become 'uneconomic' and a new 'Home' would have to be found. Thankfully West Coast Railway Co. and Network Rail have given 86259 a home in one of the engineering sidings alongside Rugby station but the site for maintenance of the loco has yet to be confirmed. Shown below is a map of the 'busy' track layout in this area together with another of the immediate area around the station at a larger scale. The 'business' of the track layout has put the webmaster in a reflective mood, the results of which are also shown below. Any old iron? Any old iron? And your father's old green tie on. For those unfamiliar with Cockney rhyming slang, napper = top of head, tile = hat, tuppence = 2 old pence (of which there were 240 such to the pound sterling!). 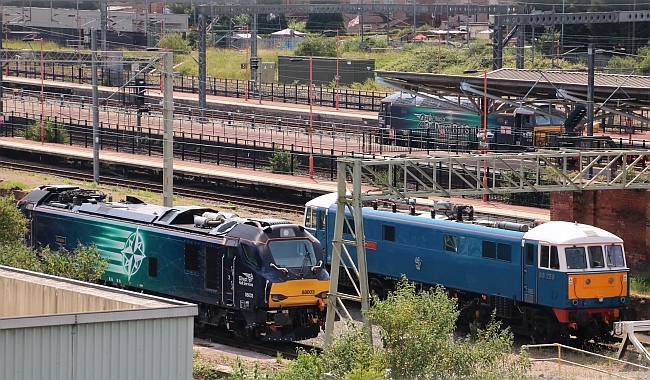 86259 sitting alongside its modern-day counterpart, in this case 88003, in the engineering sidings at Rugby station. 259 has seen a good few 88s recently; the current objective is to try to keep the class 88s all at similar mileage(!). A Class 56 loco in the livery of Direct Rail Services can be seen in one of the station platforms.